“The Power of Now: A Guide to Spiritual Enlightenment” is a book that you simply must read if you are looking for a modern take on spirituality. This spiritual book can really help you if you feel weighed down by the past or fearful of the future. The bestselling author Eckhart Tolle, helps you become more present and guides you through a rewarding journey to find “The Power of Now”. “The Power of Now” was first released in 1997 and became very successful in 2000 when Oprah Winfrey recommended this spiritual book in her magazine, O. Since then, “The Power of Now” has sold over 2 million copies world wide and is still very popular. People often refer to the “The Power of Now” as a philosophy when discussing spiritual enlightenment. “The Power of Now: A Guide to Spiritual Enlightenment” is written by Eckhart Tolle, a German born spiritual teacher. This book can help you find your way out of psychological pain by surrendering to the Now. You will discover that when you are present in the Now, you will find inner peace and also see that problems do not exist in the present moment. You will also find your authentic human power in the Now, and discover that you are already complete and perfect. Eckhart Tolle’s unhappy life experience is the catalyst that has inspired him to write this spiritual book. He describes his childhood in Germany as unhappy. His parent fought a lot and eventually split up. At the age of 13, Eckhart Tolle moved to Spain to live with his father. He studied language, literature and astronomy at home, since his father didn’t insist that he should attend high-school. As an adult, he moved to England in order to attend the University of London. He graduated with the highest marks in his class,and got a job at the prestigious Cambridge University. In the meanwhile, he also struggled with severe depression. This painful experience was very important as it forced out his “inner transformation”. At the age of 29, a radical spiritual transformation changed the course of his life. His spiritual transformation virtually dissolved his old identity. Eckhart Tolle was so depressed that he really wanted to die, but one night a very strange thing happened to him. He could hear himself thinking: “I can not live with myself any longer” and a question arose: Who is I and who is myself? When he woke up the next morning, he felt peace for the first time in his life. Eckhart Tolle later understands that his own spiritual transformation took place because he felt so much pain. His mind-made self – with all its problems from the past and fear of the future – collapsed and dissolved. All that was left was the presence of being; observing and watching. As Eckhart Tolle became totally present, without the mind-made self, he could feel peace. After his spiritual transformation, Eckhart Tolle spent two years of his life sitting on a park bench in London, in a state of deep bliss. He thought that everything was miraculous and very peaceful. During this time he also came across his former Cambridge students who asked him about his beliefs which made him start his journey as a spiritual teacher. 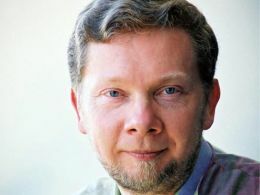 In 1995, Eckhart Tolle moved to Vancouver – where he still lives and where he also met his wife. After settling down in Vancouver, he started writing about his spiritual transformation, where he discovered the importance of being present. Two years later, the book “The Power of Now” was completed and published. “The Power of Now” focuses on the “Ego”, the false self. Eckhart Tolle explains in the book that the ego is a mind-made self – a mental image of who you are, based on personal and cultural conditioning. This mind-made self, this inner voice or thought-process often comments, compares, complains, judges, likes, dislikes etc. Through the voices and thoughts, the ego makes sure that we relieve our past and/or rehearse imagined future situations. This is how the ego survives and it can be very dis-empowering to follow the voices/thoughts of the ego. There is a deeper sense of self than the ego. By becoming present we can let go of the pain from the past. By becoming present we can also let go of the fair of the future. Nothing exists outside the present moment. The past and the future are illusions and only exist through our attention on them. By watching the thinker in your head, you will realize that there is the voice, and here I am listening to it. The involuntary thinking will subside as you become aware of this deeper self as a conscious presence. The conscious presence will give way to stillness and peace. We at SpritualCoach.com highly recommend “The Power of Now” by Eckhart Tolle, to inspire you on your spiritual transformation journey.